The book aims to reinvigorate debate on the role of FDI for development. 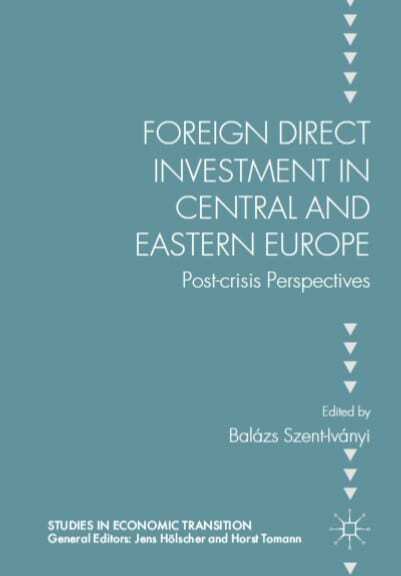 Focusing on the Eastern member states of the EU, the volume includes contributions from both established and early career scholars in the field and provides a comparative analysis of the trends, impacts and policy-related questions of FDI since 2008. 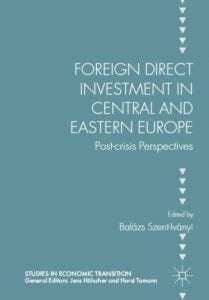 The main message of the book is that beyond its cyclical effects, the Great Recession and the changing competitiveness of the CEE countries have changed the structure of FDI received in the region. FDI promotion policies, as well as wider national development policies have, however, only partially adapted to these changes, and there is thus a strong need for further policy adjustments. Since 1989, many CEE governments saw FDI as a sufficient means to generate employment and provide capital, technology and knowledge to modernize their economies. In order to achieve this, they created policies which provided foreign investors with generous incentives, often at the expense of the domestically owned business sector. Due to these policies, as well as the competitive advantage of the region (“cheap, yet skilled labour”), the CEE countries joined global value chains (GVCs) as cheap manufacturing bases, producing relatively little added value. The sustainability of this FDI-driven development model however has been increasingly questioned, even before the crisis, but the crisis has exacerbated many, previously existing trends. FDI has had ambiguous effects in the region, its amounts seem to be in decline, and many companies are relocating their activities from CEE countries due to shifts in the region’s competitiveness. Value capture, i.e. a firm’s ability to keep the surplus of its production within the geographic region where it is situated is seen as especially problematic in the CEE countries. A high degree of value capture would allow CEE-based companies to reinvest in the region, generating new tangible and intangible assets, and thus leading to development. Paradoxically, the value capture of CEE subsidiaries does not improve even if their activities are “upgraded”, i.e. they shift to higher value added production or service provision. CEE companies embedded in global value chains face constant cost pressures, and multinational subsidiaries repatriate significant shares of their profits, leading to low value capture. The value generated along the value chain is thus mostly captured by the lead firms in the chain, usually located in Western developed countries. The book argues that the CEE countries are caught in a low value capture trap, which can be seen as a reinterpretation of the middle income trap. In order to escape this trap, the countries in the region need to switch from a development model based on FDI and physical capital accumulation to one driven by local innovation and knowledge. This is not an easy task, and can take decades, but it is essential that governments start putting larger emphasis on this shift. The book reflects on the possibilities for how this shift could be enacted, but this is a topic on which more research is clearly needed. A greater focus on supporting innovative domestic companies however should not lead to a rise in anti-multinational populism, or national capitalism. Some countries in the region have embarked on such routes, which cannot support the emergence of dynamic, innovative and outward-oriented companies, and thus do not help escaping the low value capture trap. Following a detailed introduction by Balazs Szent-Ivanyi, where he summarised the key arguments of the book, Tomasz Mickiewicz commended its thorough investigation of an interesting topic and broadened the debate, quizzing the broader context in which FDI could benefit local economies and local entrepreneurs. Randolph Bruno presented some recent findings demonstrating how FDI had benefited countries across the EU, as well as other middle or low income countries and argued for a balanced understanding of the contribution of foreign investment to the region. Slavo Radosevic, echoing some earlier comments by Tomasz, questioned the broader context further and in particular, the policy context and the role of the state in fostering local innovation and encouraging technological upgrading. Some of these discussions will continue at the Centre’s (CCSEE) conference on June 26th and 27th on technology upgrading. Find out more on the conference webpage.